Another major focus of our work group is the study of the formation kinetics of nanostructured thin films. The challenge is to find the link between the production conditions, the formed hierarchical structures, and the function of the resulting thin films. This link should allow to optimize the production processes of functional thin layers for applications such as organic and organic/inorganic hybrid solar cells, respectively. Solution processed bulk heterojunction polymer solar cells are becoming viable technology for sustainable energy generation due to their rapidly increasing efficiencies and their potential as a low-cost, printable, and flexible renewable energy source. GIXD detector image of a dry P3HT/PCBM thin film prepared by doctor blading inside our dedicated GIXD/GISAXS sample cell for in-situ studies of thin films (cf. Fig. 2 and 3). 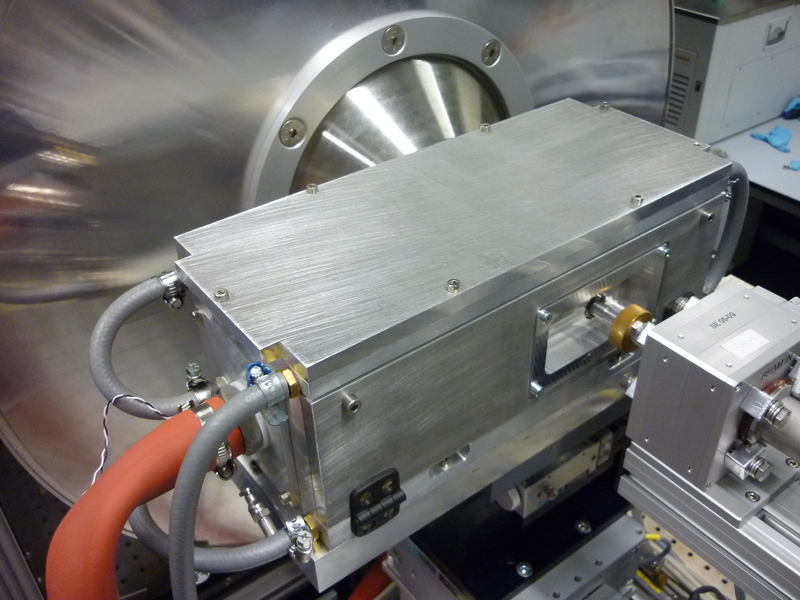 The measurement was performed at our new highly customized SAXS/GISAXS instrument. Little is known about the structure formation of the blend films and how it can be controlled. In Fig. 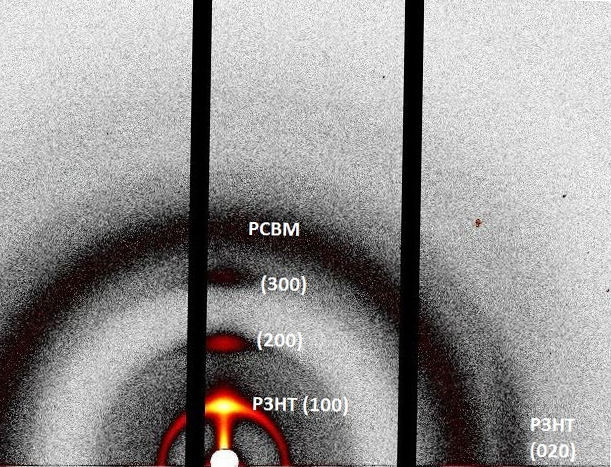 1 the 2D grazing incidence X-ray diffraction detector image of a solution processed thin film of a blend of the conjugated polymer P3HT and the fullerene derivative PCBM is displayed. From such data the crystallinity and texture of the polymer can be determined and information about the intercalation of the fullerene can be achieved, especially when combining the studies with grazing incidence small angle scattering (GISAXS). The aim of our studies is to characterize the structure formation of the thin films with highly complex compositions during their formation. Using different well-defined incident angles below the angle of total reflection of the film forming material, a depth profile of the structure formation process can be determined. The combination with optical reflectometry allows the inline recording of the film thickness during the drying process and optical spectroscopy is intended to be used for the determination of the quantum efficiency simultaneously to the other methods. Fig. 3: View into the sample cell. The doctor blading system with the glas plate used as thermostated substrate holder and the high precision applicator operated by an automated pneumatic vibration-free motor drive is visible. For these experiments a special sample cell (Fig. 2) has been developed in our group which allows to prepare a fresh film by doctor blading (Fig. 3) and starting to measure still during the preparation procedure. During the film preparation and all over the drying procedure the vapor pressure of the solvent can be controlled by a fully temperature controlled gas flow system. The whole cell including the cell walls and the holder for the substrate are connected to the same thermostat which guarantees lowest temperature deviations within the whole sample cell. 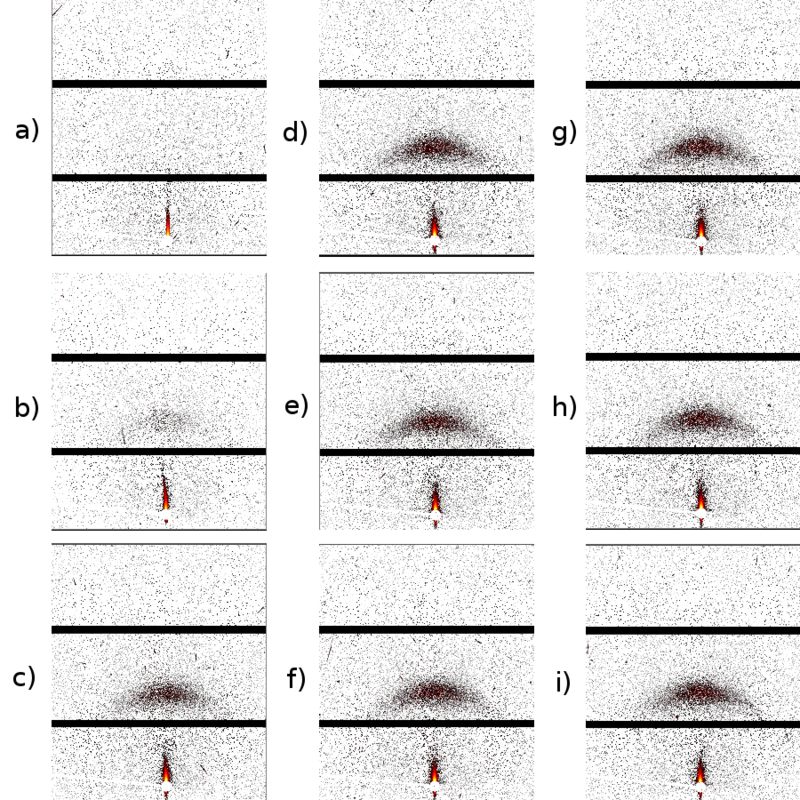 By using this sample cell GIXD and GISAXS in combination with simultaneous optical measurements, the formation of novel structures within the active layer of solution processed solar cells will be studied. There are for instance indications that fullerenes do not separate into single-phase domains but intercalate between the side chains of the conjugated polymers and form bimolecular crystalline phases. One of our projects is focussed on this issue with the aim to find the formation route of the final structure. Time resolved GISAXS measurement of the formation of a thin active layer of an organic solar cell. For each of the displayed detector images (a-i) the data were collected for 1 min. Currently we have set up and successfully tested the GIXD/GISAXS system and the sample cell. We also performed first time resolved GISAXS measurements of a P3HT/PCBM films during their drying process. In Fig. 4 it is clearly visible that the drying process can be followed by the measurements which is a proof-of-concept. The poor statistics of the single 1 min measurements, however, does not allow meaningful data evaluation yet. 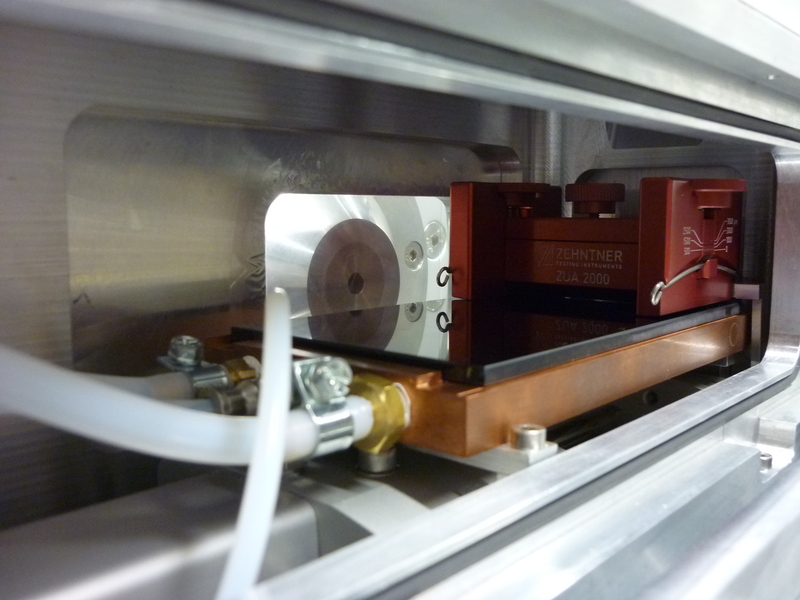 For time resolved measurements at our conventional GIXD/GISAXS instrument the reduction of the drying speed by raising the vapor pressure of the solvent is intended. In fast comparison synchrotron measurements at standard air conditions are planned.